Some might say that rules are made to be broken…. We say that Dog Walking Rules are not one of them! Spread the word. Don’t be a problem, be part of the solution! People especially children, should always ask the permission of the dog owner before they go over and interact with a dog. It is unfair on the dog to expect it to be comfortable with the presence of a stranger in its personal space. You have no way of knowing what the dog’s history is. Is the other dog attentive to its owner? Does the other owner look as if he/she is in control? Is the other dog part of a pack? Are there toys/sticks/food around? Does the other owner look keen to meet? Is the owner taking part in training their dog? These are all things to consider before you allow a meeting. 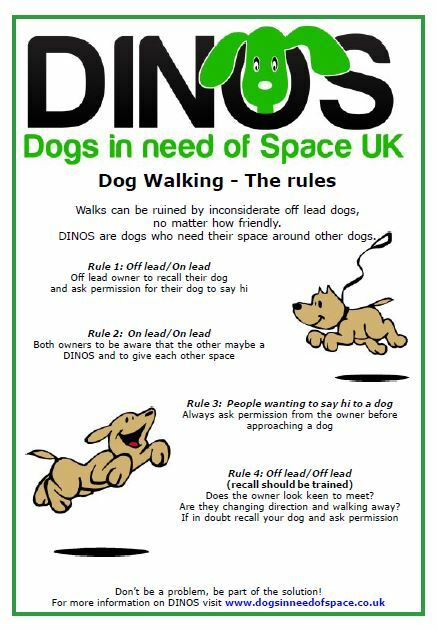 If in doubt then recall your dog and ask permission of the other owner.